Uber made official a platform to help patients get to their doctors this week — but it's far too early to tell whether the famously disruptive tech company can shake up healthcare. The effort builds off a pilot program with about 100 healthcare organizations, including big name hospitals like MedStar Health, and is available for "healthcare organizations of all shapes and sizes." It promises fewer no-shows and more on-time appointments. Ride-share services like Lyft have been creating smaller partnerships with healthcare groups, and a few startups focus on getting patients where they need to go, often through those services. Uber, though, has a far bigger footprint, with services in more than 250 U.S. cities. Its healthcare-specific platform ups the ante. 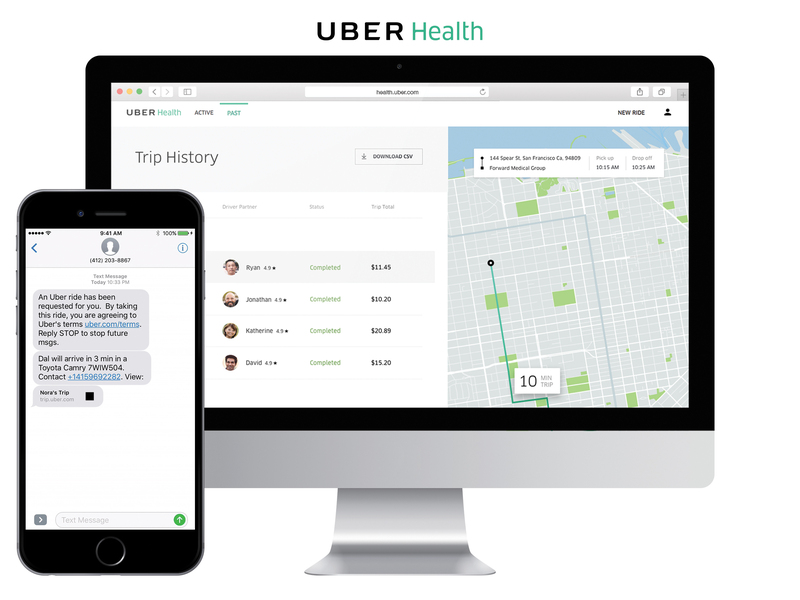 Uber Health allows healthcare workers at participating organizations to schedule rides for their patients using an online dashboard. If a patient has a cell phone, they will get trip details through text. The driver only sees the patient name and pickup and drop-off locations. Uber says it is HIPAA-compliant. The healthcare company pays for the ride through its account. This is likely to be a cheaper option than using taxies, and smaller organizations that don't have their own vehicles to transport patients may find Uber Health a good fit. Here's a snapshot of what we know so far — and what the potential for the platform might be. What is the state of healthcare and ride-sharing today? The Transit Cooperative Research Program estimates non-emergency medical transportation, or NEMT, spending for Medicaid alone is $3 billion each year. John Brownstein, chief innovation officer at Boston Children’s Hospital and co-founder of NEMT platform Circulation, said there isn't a ton of data, but the overall market goes well beyond that. Circulation already partners with Uber, Lyft, ambulances and stretcher van transportation services to provide a software backbone for NEMT. The platform works with provider EHRs to help with documentation. Brownstein, who has advised Uber on healthcare, said that when digital health was surfacing, people gravitated more toward mobile apps and tools versus the determinants of access to healthcare services. Now they've discovered the importance of just getting to the service. “Transportation is a component of the patient’s journey,” Brownstein told Healthcare Dive, adding, “transportation for vulnerable populations is a big part” of smart-city efforts and thinking. Technology companies have noticed the opening and have been making inroads in the territory. As of December, for example, Lyft’s partnership with Circulation helped deliver NEMT services to more than 1,000 providers. "Healthcare has a bad reputation for long sales cycles, but the companies in this space have an incredible track record," Naveen Rao, health innovation analyst and founder of Patchwise Labs told Healthcare Dive. "Circulation has developed 70+ partnerships in two years, based largely on their star power and first mover status, but even smaller companies like Kaizen have gathered up a dozen customers in a year. That's big for any startup, and it's huge in healthcare," Rao said. Eventually, companies may be able to gather enough data to predict where and when a patient might need a ride. Circulation is also working to pilot bringing healthcare to the patient’s home as well as opportunities with durable medical equipment. How attractive will providers find Uber Health? The lure for providers is the potential savings. The average rate of appointment no-shows resulted in a daily loss of $725.42, according to a study from platform provider CrossCHX. Brownstein said use of taxi vouchers are expensive and hold potential for misuse. “We’re seeing a lot of a gravitational pull toward changing transportation spend” at the provider level, he said. With a streamlined system, providers picking up the bill for a cheaper ride service can gain revenue that would be absent if a patient never showed up as well as save on its transportation budget. And riders don't have to have an Uber app, or even a cellphone. While most Americans own a smartphone, that barrier of adoption is eliminated in the Uber Health model. Providers are the ones talking to Uber to organize a ride. Along with the usual text notifications for riders, Uber Health will include the option of receiving a phone call with the trip information. Lack of reliable transportation is associated with poor health outcomes, but whether the initiative will actually result in improved patient attendance and health is still an open question. It’s clear that transportation issues keep some patients from going to scheduled appointments or causes them to delay care. One review of the evidence published in the Journal of Community Health found that “transportation barriers to healthcare access are common, and greater for vulnerable populations.” Over 25 separate studies, 10% to 51% of patients said transportation was a barrier for them, according to the article. But ride-sharing is far from the only method for getting to an appointment. Access to public transportation varies by geography, and Uber operates in a number of places that don’t have reliable public options. Some patients may prefer to drive themselves, but have trouble affording gas and car upkeep or repairs. So some existing programs offer stipends to help people make appointments. There is little data to go on so far but one study published in JAMA Internal medicine this year found virtually no difference in missed appointments between a group of patients offered ride-sharing services and a group that wasn't. Only about a quarter of those who were offered the service agreed to it. If nothing else, the new Uber platform should produce more data to determine how viable the theory is for decreasing patient no-shows. Who will the drivers be? The minimum requirements for a regular Uber driver are a valid U.S. driver’s license and an eligible four-door vehicle. Also, drivers must be at least 21 with at least a year of licensed driving experience in the U.S. An online screening looks at driving record and criminal history. Healthcare Dive sent a series of questions on this topic to Uber, but did not receive a reply in time for publication. A few Uber drivers have made the news for criminal acts while on the job, and more than a few are the subject of complaints aired on social media. Uber has a limited ability to screen and evaluate its 2 million drivers, and it’s not known whether Uber Health drivers will receive any special scrutiny. Uber Health riders may need more from a vehicle than just four doors. It’s unclear how Uber might ensure patients who use wheelchairs, scooters or other medical devices will have the accessibility they need.